Ever since we hit the road we have found that we hate making appointments. We just don’t like having to be in a certain place at a certain time. We want to come and go as we please. We resent the feeling that we are being told what to do. In a way we feel like teenagers again except this time we are teenagers with resources! But we don’t believe that we are irresponsible. Rather we think of ourselves as unresponsible. 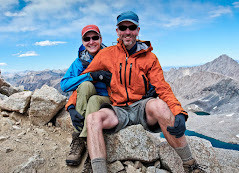 After resting up from our 3 week/200 mile hike on the John Muir Trail (JMT) we did a 3 day/2 night backpack trip hiking from Tuolumne Meadows to the Yosemite Valley on the portion of the JMT we had skipped. It really felt different preparing for such a short trip after having just done a three week long one. We didn’t start packing until about 10 PM the night before and we didn’t even weigh our food. Then when we started out something didn’t seem quite right but we soon figured it out. It was our clothes, they were too clean and they looked too bright. It took some getting used to. During this trip we also did a side trip and climbed Half Dome, probably Yosemite’s most famous feature. 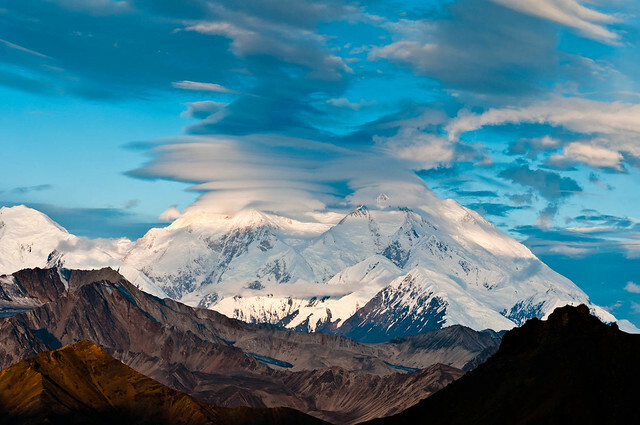 This is one of those iconic hikes and is extremely popular as a day trip from the valley. 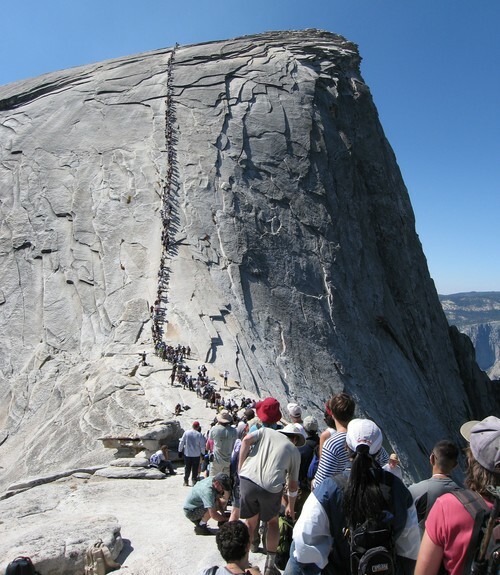 The number of people allowed on Half Dome each day is limited so one must first obtain a permit. In 2011 there were 300 permits available each day for day hikers and 100 for backcountry users. Reservations could be made up to four months in advance. The backpacker permits are not as in demand so are much easier to obtain. We had no trouble to obtain one in conjunction with our backcountry permit. 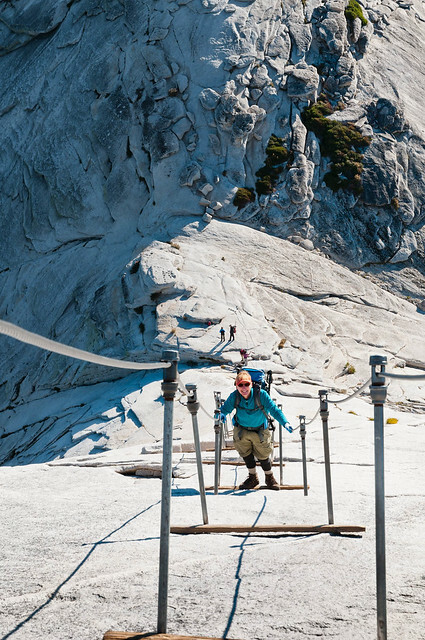 The best way to climb Half Dome is just how we did it. We backpacked in and camped as close as we could legally (at the junction of the JMT and the Clouds Rest Trail), two and a half miles from the top. We left camp at 3:30 AM and hiked, then climbed, to the top in the dark. It was disconcerting to not be able to see our destination as there is no marked route across the rock surface of the steep sided Sub Dome. In the daylight it would have been no problem. We were quite relieved to finally see the beginning of the cables on Half Dome. The route up Half Dome first crosses Sub Dome from the right. Not easy to see in the dark! The last 400 feet of elevation gain, and the most challenging for many individuals, require the use of two cables in order to climb the extremely steep rock. It is slow and extremely crowded for much of the day. However, our early start really paid off as we had the cables completely to ourselves and we were first on the summit. We were alone on top for about 15 minutes before a few more individuals arrived. There were only about a dozen of us there for sunrise, much more pleasant than being with the hundreds of people who would be there later in the afternoon. Despite the permits the cables still get quite crowded around mid day. I heard from a fellow that it had taken over an hour to get down the cables the previous afternoon. However when we started down about 7:30 AM there were only a few individuals coming up so it was pretty quick (but not too quick!). While in Yosemite we also visited the Mariposa Grove to see some Giant Sequoia trees. When we first entered the grove it was like entering a different world. It felt as though we had suddenly shrunk or had entered a land of giants. It is challenging if not impossible to photograph these immense trees to convey that feeling. Perhaps the most impressive tree in this grove is the “Grizzly Giant” estimated to be at least 1800 years old and 100 feet in diameter. 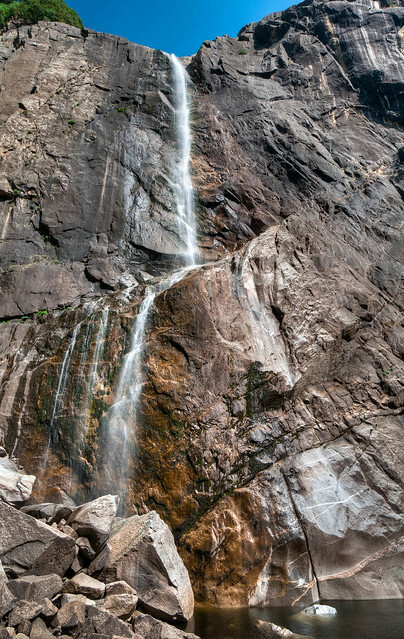 We had been avoiding the Yosemite Valley because of the inevitable crowds but there were a few sights we wanted to see before leaving the park such as Bridal Veil Falls. We also went to Glacier Point as it is supposed to offer the best view of Half Dome and the Yosemite Valley. However it is an extremely popular spot at sunset (in order to obtain a parking space one is advised to arrive by early afternoon) and we found the crowd a little too intense so we left early. The next afternoon we went partway up the Upper Yellowstone Falls Trail stopping at the base of the falls. On the way down we stopped at Columbia Rock for a great view of Half Dome and the Yosemite Valley at sunset. We were treated to some outrageous clouds. 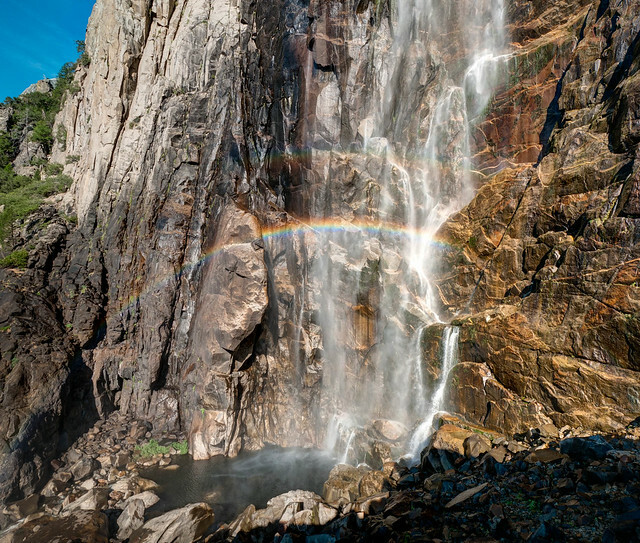 Our Yosemite National Park photos are on Flickr. We then headed toward Death Valley National Park and had to drive through Tioga Pass just east of Yosemite. Winter was definitely on the way as the next day the pass was closed temporarily due to snow. We had driven through Death Valley in early August on our way to California and the heat was brutal. However temperatures now were much more moderate when we were there, within the 80’s and low 90’s. While there were backpacking opportunities but we were unwilling to carry all the water we would need. We were both surprised by Death Valley; by the large amount of vegetation even at the end of the scorching summer and by the varied terrain. There are quite a few places of interest as well as a variety of hiking routes. It is recommended that hiking be done in the cooler months, October through April. 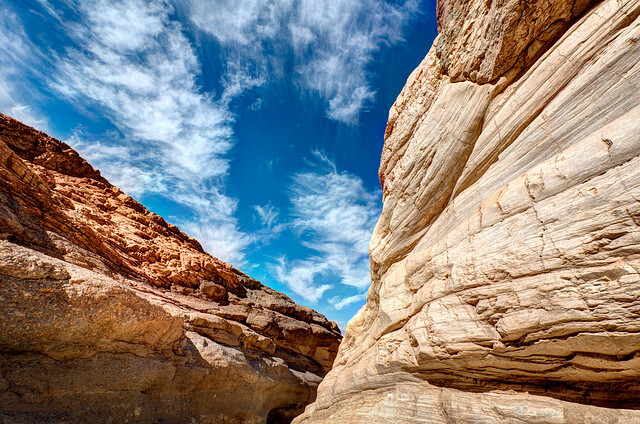 Death Valley is bounded by mountains that contain enumerable canyons and perhaps the most striking is Mosaic Canyon. Whereas the walls of the other canyons we walked through consisted of rough rock the walls in lower Mosaic Canyon are marble. Apparently marble is formed when limestone is compressed and heated. We did the short hike through Golden Canyon to Gower Gulch including the short side trip to see the Red Cathedral. We also went to the Mesquite Flat Sand Dunes. If you’ve seen the first Star Wars movie then you have seen these dunes. 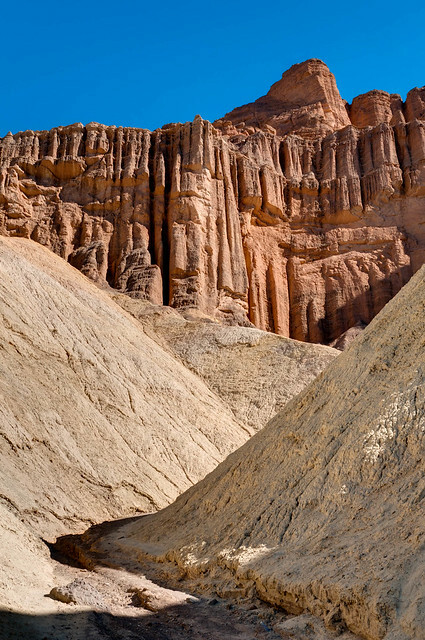 In fact several scenes were filmed in Death Valley and someone has identified the location where these scenes were filmed. 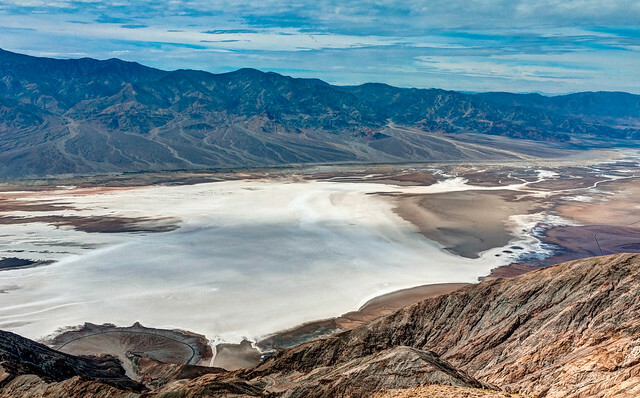 Our last stop before leaving the park was Dante’s View for a view of Badwater Basin which, at 282 feet below sea level, is the lowest point in North America. 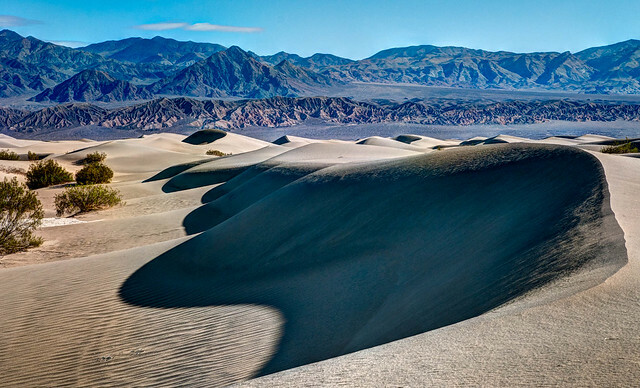 Our Death Valley National Park photos are on Flickr. 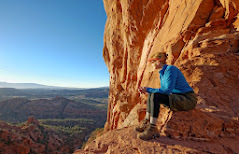 Now that we are caught up with editing and uploading photos as well as doing some car and motorhome maintenance we plan to head back to Zion, Bryce and Grand Canyon National Parks to do some more backpacking. 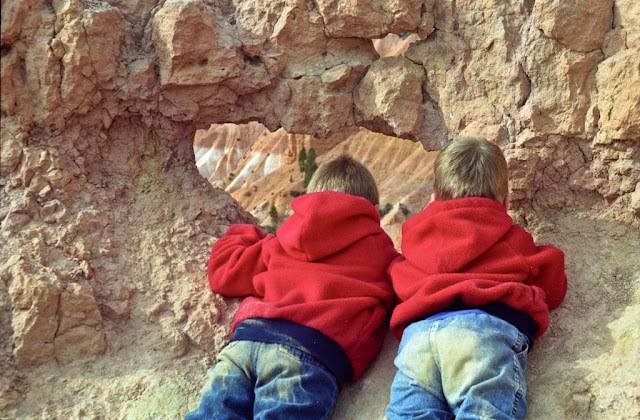 I have always loved the outdoors and as a kid growing up in Kentucky I longed to see places like Yellowstone National Park and the Grand Canyon. In September 1977 I left Kentucky with John to relocate in Washington State (probably the best decision I have ever made). 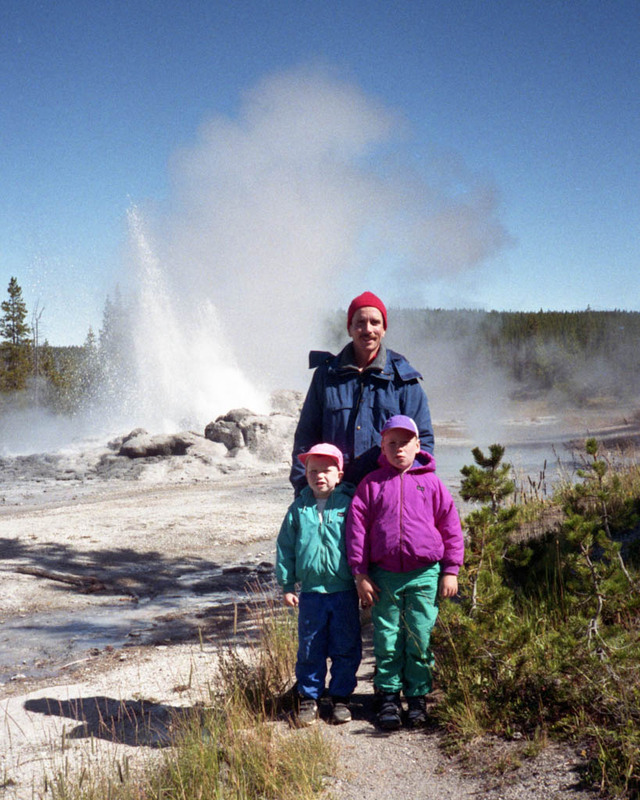 We took over a month to travel west and to my delight one of the places we visited was Yellowstone. 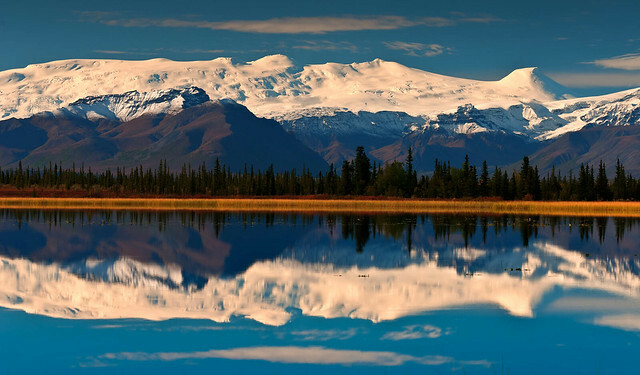 ... and Olympic National Parks in Washington State. 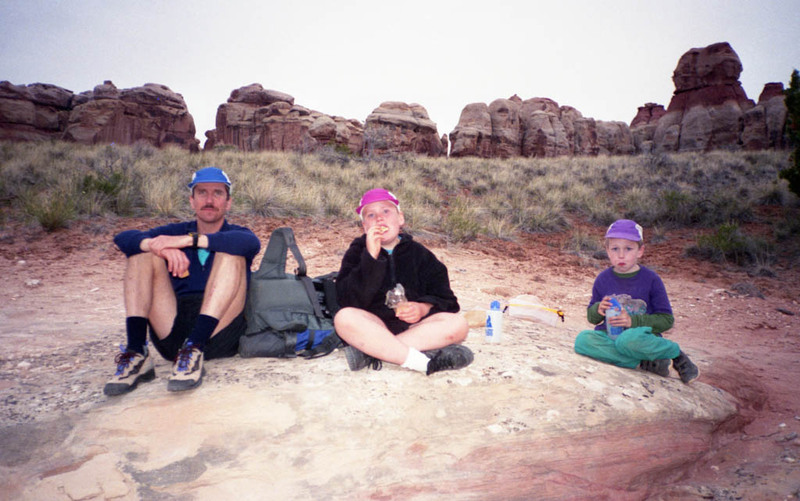 We also began spending many of our vacations exploring national parks in the southwest US including Bryce Canyon …. 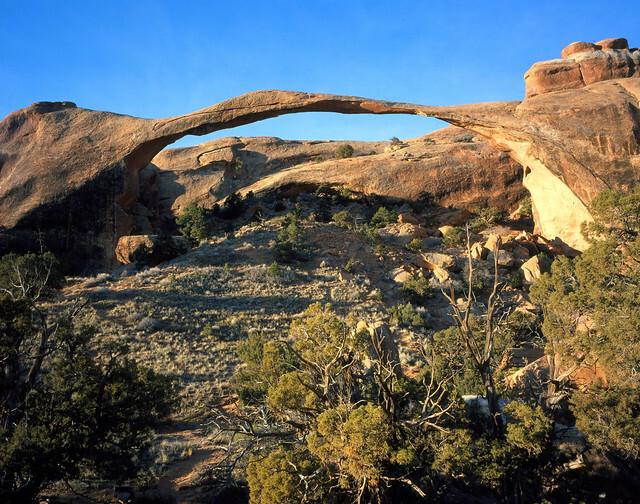 … and Canyonlands National Parks in Utah. 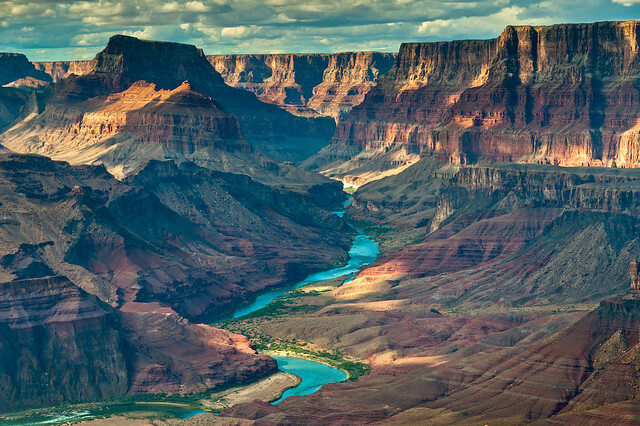 We also went to Grand Canyon National Park in Arizona and Yellowstone National Park in Wyoming. 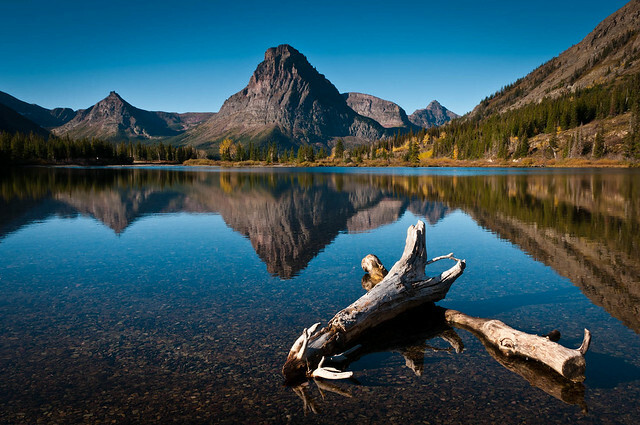 … as well as Glacier National Park in Montana. 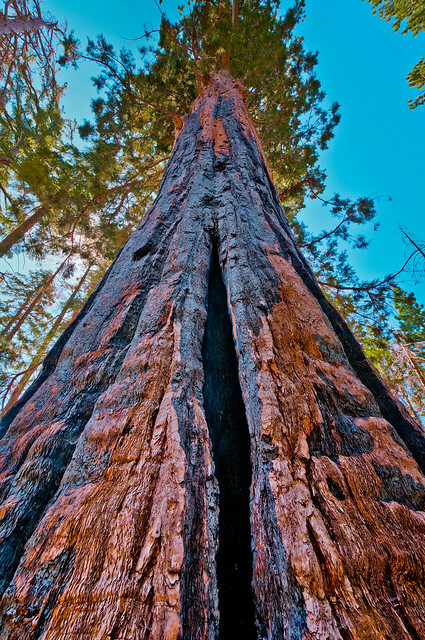 …Sequoia and Kings Canyon National Parks in California. 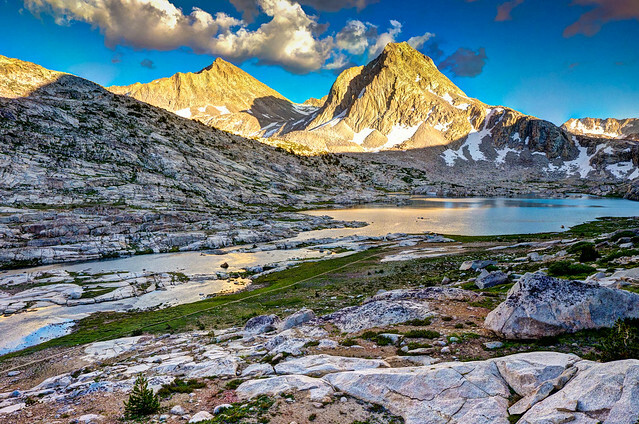 The US currently has 58 National Parks and we are so grateful to those who had the vision to set aside so many large areas as National Parks in order to protect them for the generations to come. Early advocates include Steven Mather and John Muir as well as Teddy Roosevelt. 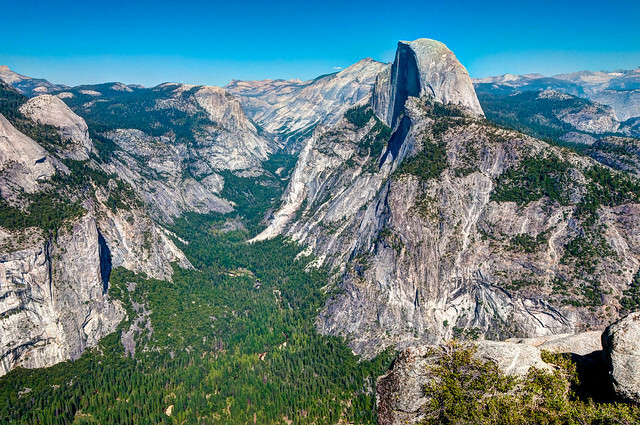 A very entertaining way to learn more about the history of our National Parks is to watch the very aptly named The National Parks: America’s Best Idea, a six part video by Ken Burns. There is also a book by the same name available. However, we have not always known how to best manage these national treasures. Several of our National Parks have suffered damage in the past done in a misguided attempt to attract and entertain visitors. Some of this damage is irreparable. 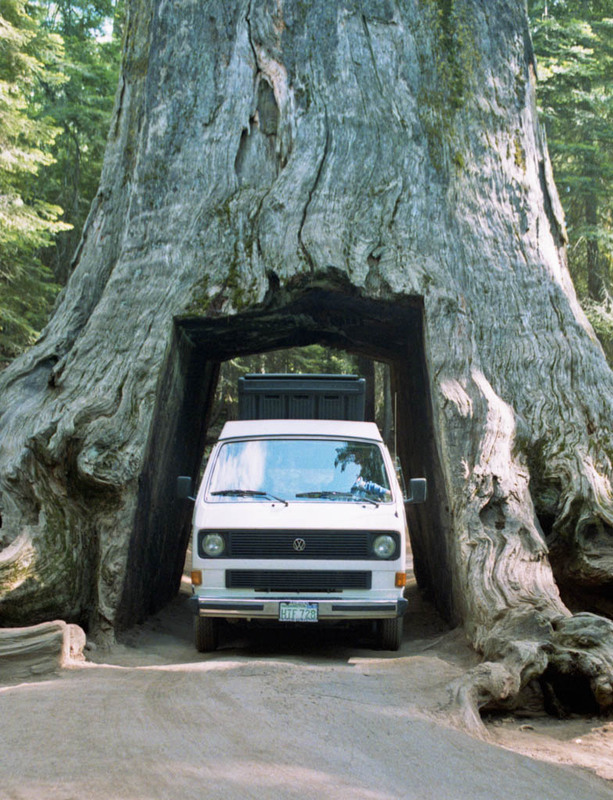 For example the “tunnels” cut through several Giant Sequoia trees. The “Wawona Tunnel Tree” within the Mariposa Grove in Yosemite was once the most popular feature in that grove until it finally fell in 1969. There are other “tunnel trees” still standing in various groves and remain popular spots to get one’s picture taken. Back in 1992 even we succumbed to the temptation. Fortunately the damage caused by some poor decisions may, over time, be reversed. 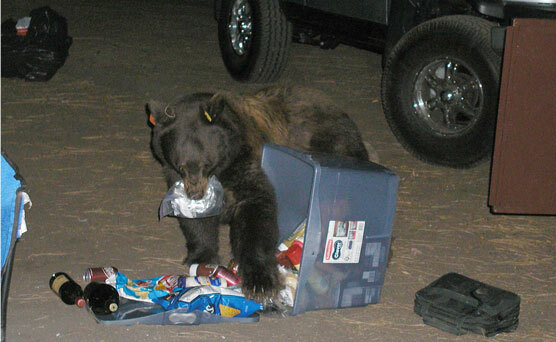 One of the worst decisions ever made has got to be the past practice in Yellowstone of allowing bears to feed at a park garbage dump for the entertainment of park visitors. 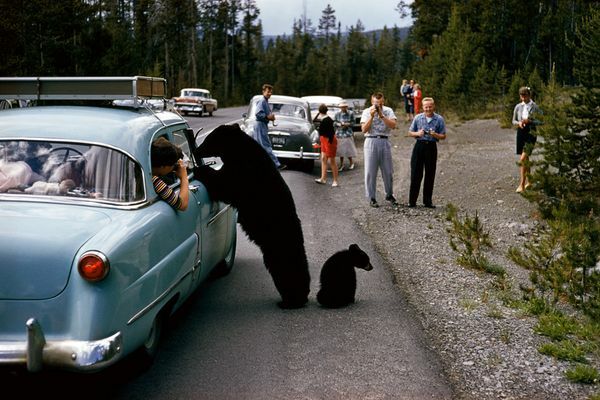 In addition tourists were allowed to feed bears directly from their cars. This practice, which proved to be extremely bad for the bears as well as some park visitors, was finally discontinued in 1970. Now all efforts are made in National Parks to prevent contact between humans and bears primarily by preventing bears from obtaining any human food. 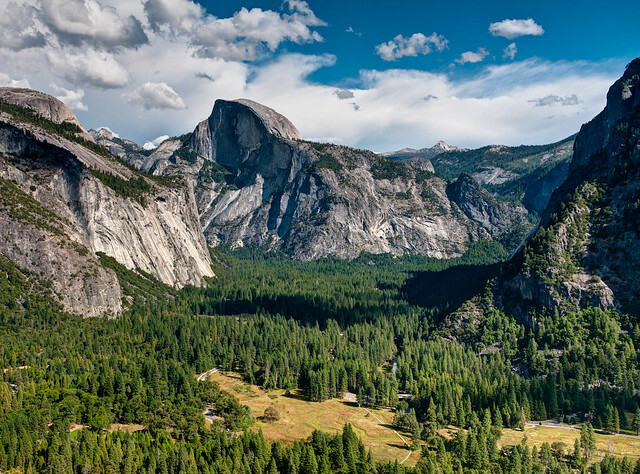 In many parks, such as Yosemite, visitors are required by Federal Law to remove all food and food related containers from parked cars and put in the bear proof metal boxes provided in every parking lot and campground. 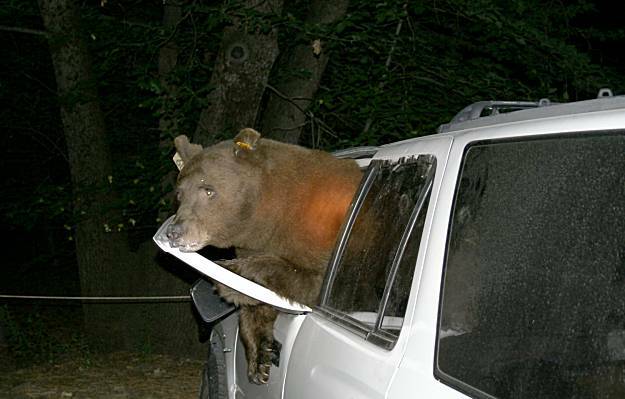 The reason being that bears regularly “prowl” parking lots and have learned to identify any food related container. They simply look through car windows in order to decide which cars to “break into”. And it is not enough to just put food in one of the bear proof metal boxes. One has to remember to close the door and lock it. All hikers and backpackers are encouraged to keep their food within reach as bears are adept at sneaking up and snatching unattended packs. 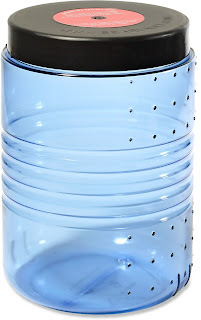 In addition all backpackers are required to store their food in bear resistant food containers. Another misguided practice was the policy to suppress fires whether naturally caused or not. This policy was began to be questioned in the 1960’s when it was observed that this practice resulted in a greater build up of dead wood on the ground as well as allowing an overgrowth of trees. In addition some species rely on fire for their survival. 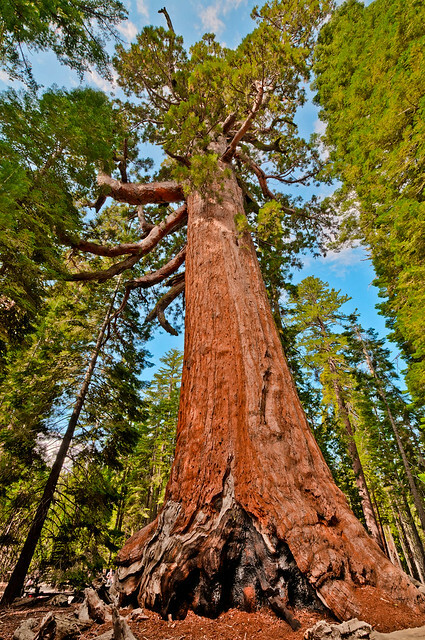 For example, Giant Sequoias need the heat from fire to dry their very dense cones in order to release the seeds. As a result the National Park Service utilizes what it calls “controlled burns” and “managed fires” in an attempt to maintain the health of the park’s forests. Yes, we’ve made mistakes but we’re learning. For example several parks have made an attempt to reduce traffic by instituting a shuttle bus system. 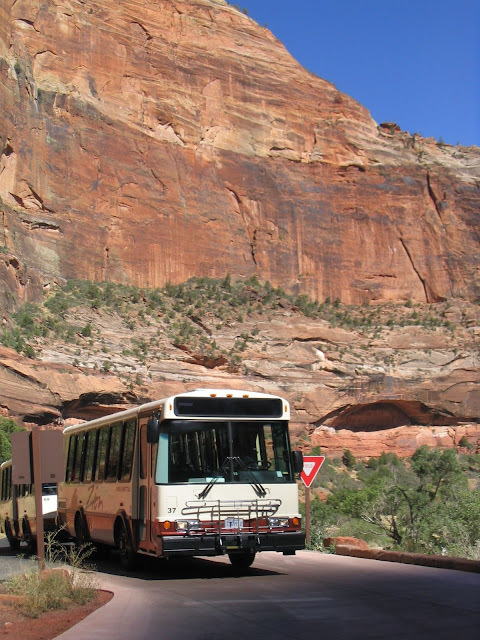 We can well remember how incredibly congested the road through the valley in Zion National Park was prior to prohibiting private vehicles (unless a registered guest in the lodge) and providing free shuttle buses. 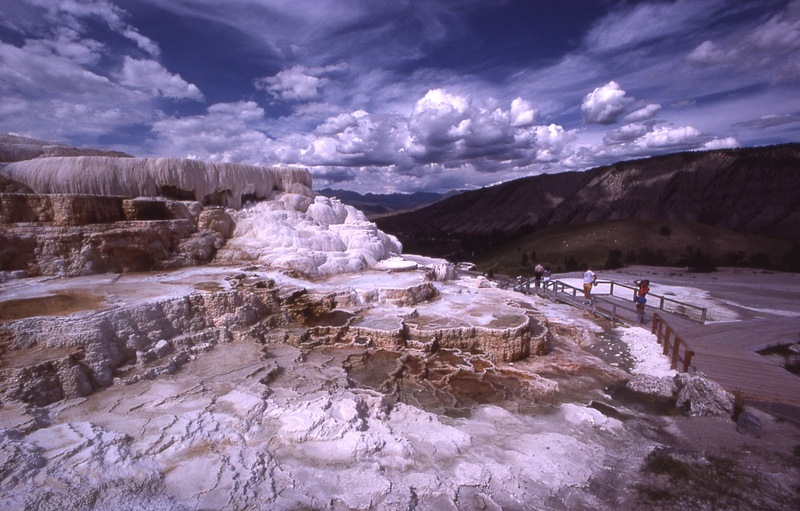 In addition in the past unlimited access to popular areas and features within National Parks led to their overuse so quotas were set and permitting systems were initiated to limit the number of people. 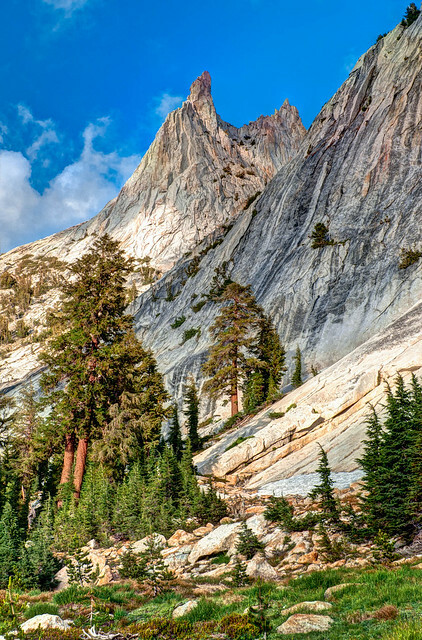 For popular destinations such as Mt Whitney where the number of people wishing to climb it exceeds the number of permits available then a lottery is held. Unlimited access also created unsafe conditions. 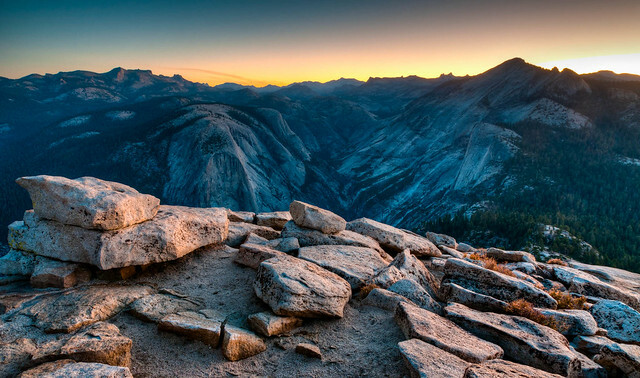 For example before the permit system was put in place as many as 1200 people a day attempted to climb Half Dome in Yosemite. This led to long waits and dangerous overcrowding on the cables needed to assist one to climb or descend the extremely steep rock safely. We’re learning but something we need to remember is that nothing is certain except change and this is especially true when it comes to nature and our National Parks. Unfortunately some of the changes, whether due to man’s impact on our environment or natural causes, can be devastating. And they can happen within our lifetimes. There are features we have seen in the past but will never be able to see again. When we visited Yellowstone National Park back in 1977 Mammoth Hot Springs had steaming water flowing freely over the entire huge formation but since then a minor earthquake shifted a vent and left the beautiful Minerva Terrace completely dry. It’s still interesting to see but trust me, it is nothing compared to how it used to look. 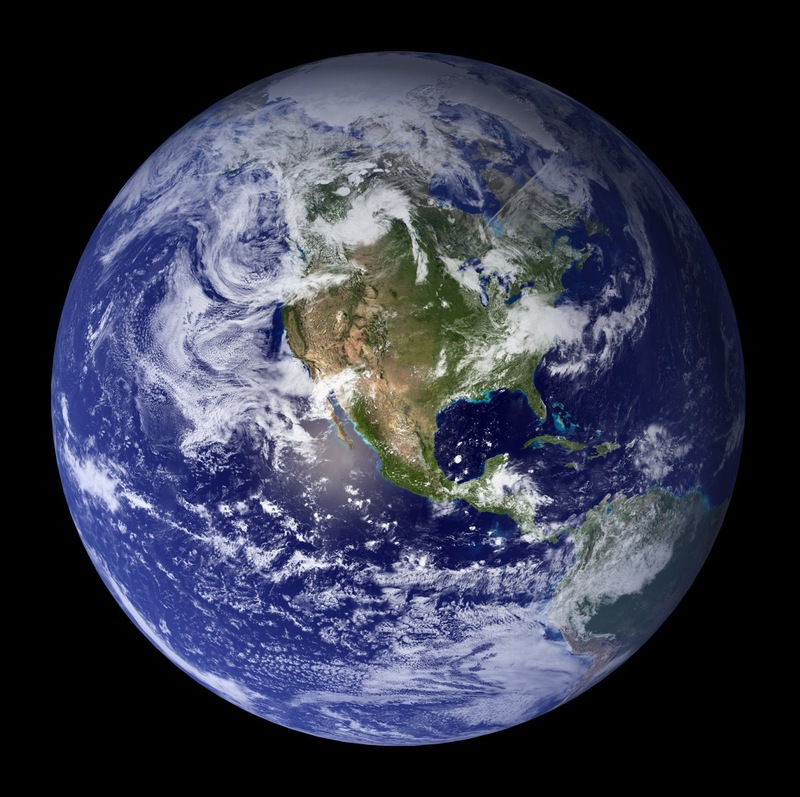 Changes have also occurred in places we had not yet seen. 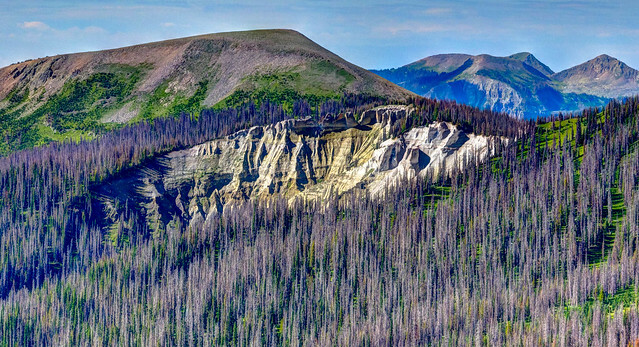 Within the last decade an infestation of Mountain Pine Bark Beetles in Colorado has killed about 80% of the pine trees. We’re disappointed that we will never have the opportunity to see green mountainsides in Rocky Mountain National Park. Dead pine trees in Rocky Mountain National Park look just like these dead spruce trees also killed by bark beetles in southwestern Colorado. I wonder what other natural icons will be lost in our lifetime. Could the continuous activity under the earth’s crust cause other geothermal features in Yellowstone to just dry up? 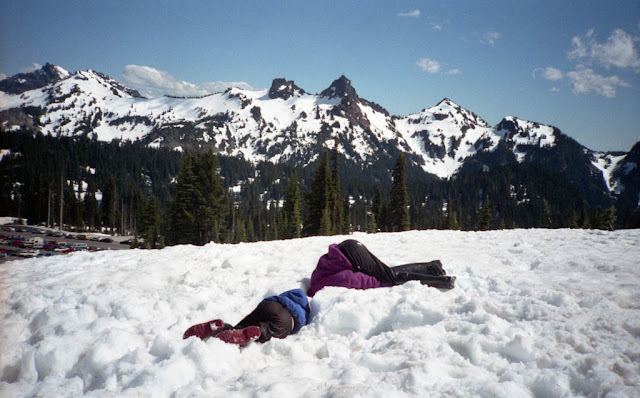 As Mt Rainier is considered the third most dangerous volcano in the US isn’t it possible that it could “blow its top” as did Mt St Helens in 1980? 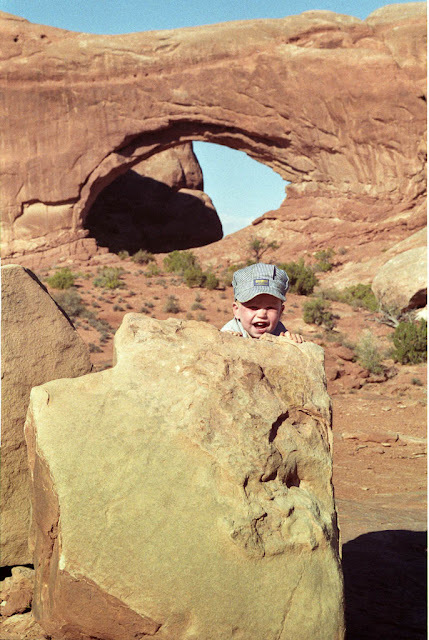 Isn’t there the potential that slabs will continue to fall from Landscape Arch in Arches National Park causing it, the second longest natural arch in the world, to completely collapse? What this tells me is that we can’t take our National Parks and their iconic features for granted and if we want to see them it should be done sooner rather than later. For those planning to visit a National Park we have some practical advice. First of all, if possible plan to visit before Memorial Day or after Labor Day. Lodging at popular parks can be challenging to obtain and reservations often need to be made months in advance. 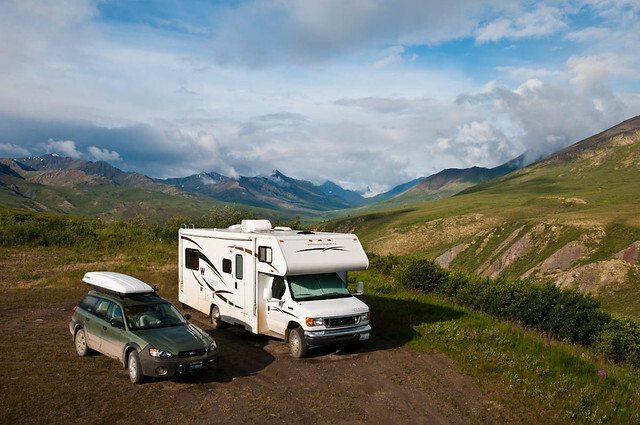 Another option well worth considering is renting a motorhome. Personally we love the convenience of having all of our stuff with us all of the time and preparing our own food (not to mention easy access to a flush toilet in a clean bathroom). Relatively small ones can be quite comfortable to travel in and are not too difficult to drive. We have noticed that this option is extremely popular with European travelers in the southwest US. Reservations for campgrounds in popular parks should also be made in advance. However if visiting outside of the prime “tourist season” there may be some last minute availability. If not then there are frequently commercial campgrounds located outside of parks that are likely to have space available. We make few reservations (remember, we hate appointments) and those we do are usually only made a few days in advance. In addition there may be a free campsite available nearby (we have been known to park in a Walmart parking lot). We have yet to find ourselves without a legal place to park for the night (well…there was that one time in Yukon). 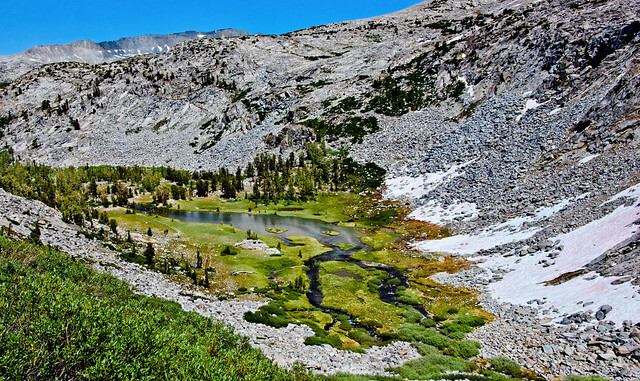 Of course in our opinion the best way to enjoy a National Park is to go into the backcountry on at least a long day hike but preferably on a multiday backpack. We realize that not everyone can do that but oftentimes one who is willing to walk relatively short distances can go beyond where most tourists congregate. By being willing to walk just a few miles one can often get better views as well as some relative solitude. We went to the popular Glacier Point for a view of the Yosemite Valley but were overwhelmed by the crowd. We then did a short hike to Columbia Rock for a different but equally beautiful view of Half Dome and the valley. Periodically a few people would stop to admire the view and take a few photos but soon moved on. 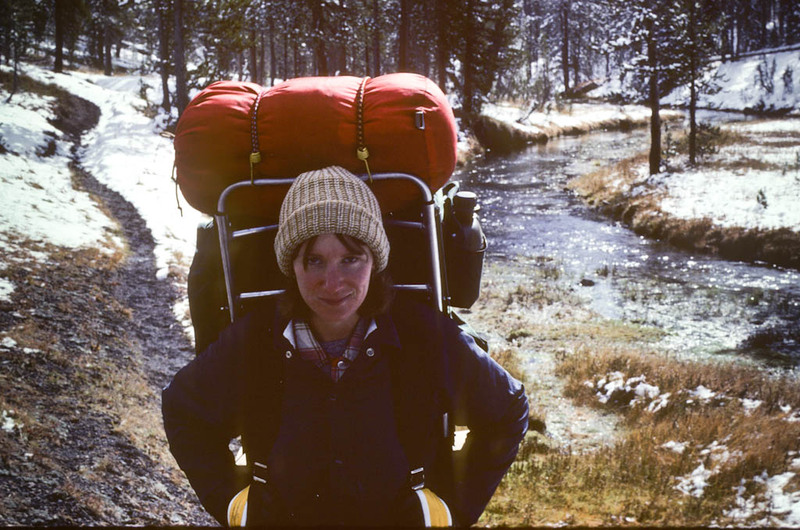 Before you decide that you couldn’t do that then think about Carol, a delightful woman we met while hiking the John Muir Trail. 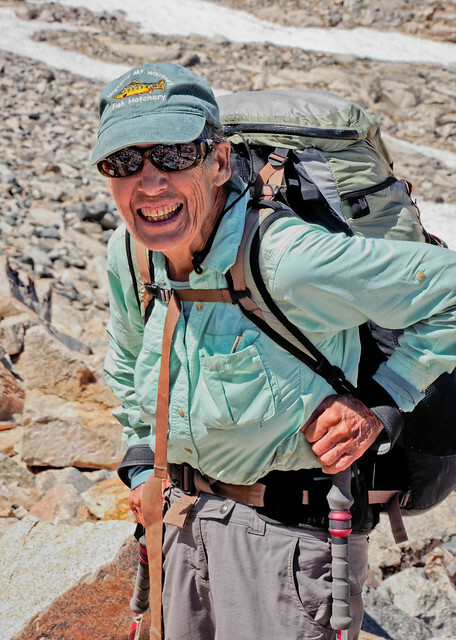 If she, at 77 years young, can still hike 200 miles carrying a full backpack then walking a few miles carrying only a day’s worth of food and water could very well be within your capability. After all, it’s only walking, putting one foot in front of the other, and most of us can still do that. I like how John Muir put it. “Thousands of tired, nerve-shaken, over-civilized people are beginning to find out that going to the mountains is going home; that wildness is necessity; that mountain parks and reservations are useful not only as fountains of timber and irrigating rivers, but as fountains of life.". 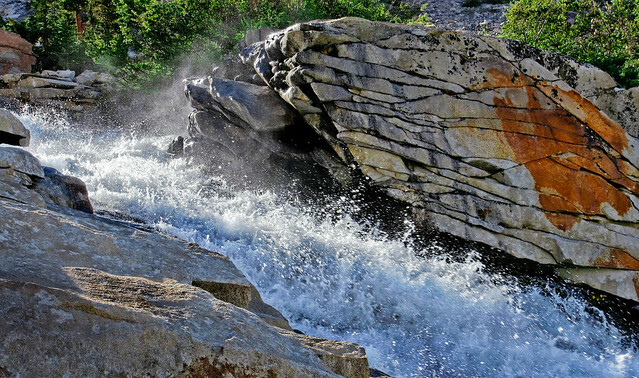 Our National parks are “fountains of life” and while the National Park Service is responsible for the protection and the preservation of these parks they can’t do it alone. They need our help. We have to be aware that not everyone shares our love for the outdoors or sees the value in protecting so much of our land and natural resources. 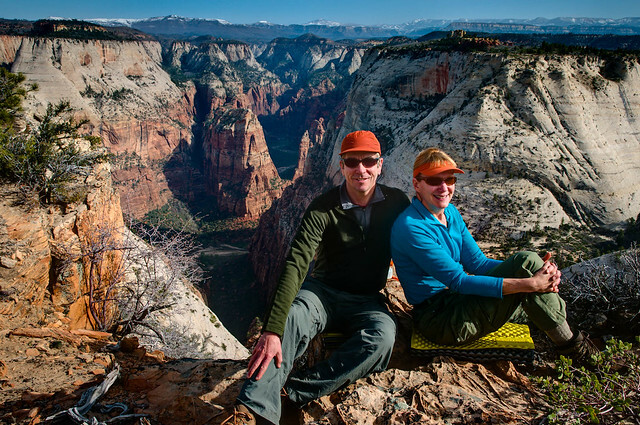 We need to elect politicians who will continue to support and protect our National Parks. Most importantly we need to fight those who want to relax current protections, exploit and perhaps even eliminate them. I agree with Ken Burns that our National Park system is one of America’s best ideas. And while we have learned quite a bit about how to best care for them there is still so much more for us to learn. But it will be well worth the effort as it seems to me that in the future these lessons could be applied on a much larger scale. I am hopeful that when we finally get serious about preserving and protecting our planet then what we have learned with our National Parks can serve as a guide. Gorgeous photos from both past and present! Thank you, thank you, for putting this together for all to enjoy & learn from, we enjoyed it immensely ! The photos are wonderful & the words are thought provoking. 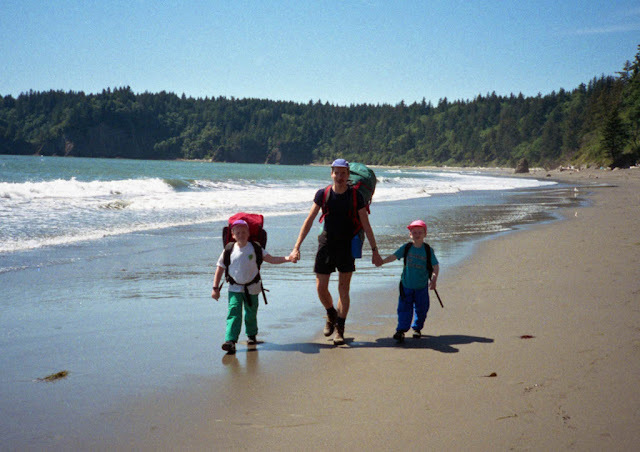 We live in Port Townsend and share your love of the Olympic Mountains and our amazing National Parks. Very nicely put! I make it a point to visit as many National Parks as I can and to tell everyone I know about them. They are a treasure and I think it would do people a world of good to get out and immerse themselves in them every once in a while!